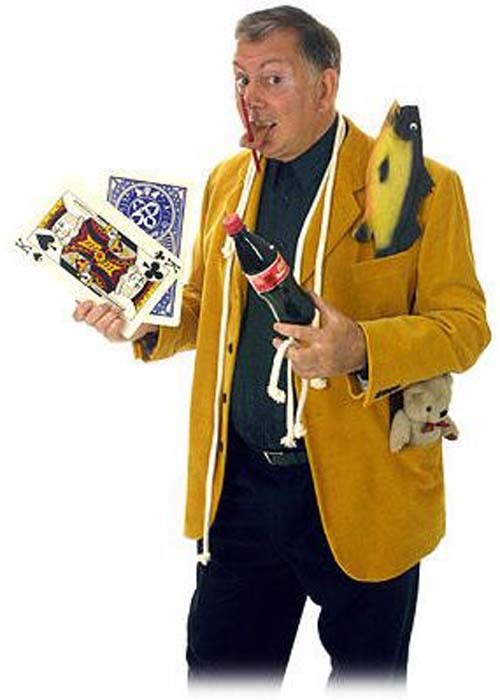 Ron has won many national and regional awards in magic. As an Associate Member of The Inner Magic Circle, with Silver Star, he is recognised by fellow magicians as being amongst the best there is. Ron is based in the West Midlands and travels throughout the UK presenting his various skills. He has also lectured to magicians from around the world, sharing his knowledge and experience. Ron is a full member of Equity and as such carries 5 Million Pounds Public Liability Insurance. Ron has a creative Wizard who works at Zonkos Joke Shop in Hogsmead. He enthrals his audiences with tales and magic from Hogsmeade. Ron was one of the first people to offer Harry Potter Themed Shows in the Midlands and he has been used by Bloombergs and Warner Brothers for Harry Potter events. This show has been used in Libraries as part of Reading weeks and half term activities. This show is a show celebrating the magic of books, it explores a wide range of styles and is adapted to suit three age ranges, under 5's, 5 - 8 and 8 - 11 year olds. It is a great threat for a shool at the end of term and very educational. This show has been repeatedly booked by Libraries in and around the region. This is a special show designed for Severn Valley Railway and aimed at children under 7. It is a 30 minute show that blends the Magic of Ron Popple and Thomas the Tank engine with the fun of learning. It is currently used exclusively by the education department of Severn Valley Railways.